Storytelling has come of age in the business world. Today, many of the most successful companies use storytelling as a leadership tool. At Nike, all senior executives are designated "corporate storytellers". 3M banned bullet points years ago and replaced them with a process of writing "strategic narratives". Procter & Gamble hired Hollywood directors to teach its executives storytelling techniques. Some forward-thinking business schools have even added storytelling courses to their management curriculum. The reason for this is simple: Stories have the ability to engage an audience the way logic and bullet points alone never could. Whether you are trying to communicate a vision, sell an idea, or inspire commitment, storytelling is a powerful business tool that can mean the difference between mediocre results and phenomenal success. Whether in a speech or a memo, communicated to one person or a thousand, storytelling is an essential skill for success. Complete with examples from companies like Kellogg's, Merrill-Lynch, Procter & Gamble, National Car Rental, Wal-Mart, Pizza Hut, and more, this practical resource gives listeners the guidance they need to deliver stories to stunning effect. 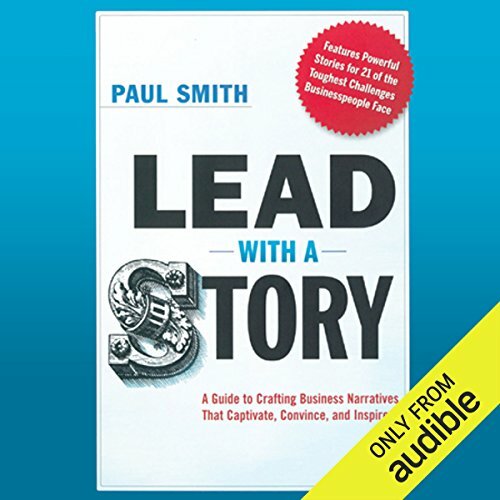 ©2012 Paul Smith (P)2013 Audible, Inc. This book proves we've so many great stories to tell. Stories can covey messages, provide encouragement, or drive people to action in any way - help people remember the message. Lead with a Story is an interesting read with over 100 already made stories inter-weaved to throughout the chapters. very inspirational on many levels!! I had expected this book to deconstruct the elements of storytelling as they relate to business. Instead, the author offers a variety of stories to use in specific business situation. This book is a "what to say," not a "how to say it," guide. I like most of the stories but too many were focused on P&G. I understand that is where he worked but this book would be better if he changed out have the P&G stories for other companies. Proctor and Gamble Saves the World! The idea of the book was fine...but I wish the author would have done more research on other industries. There were so many Proctor and Gamble stories that it felt more like an unabashed commercial for the company than it did a true informational read. It was distracting. What was most disappointing about Paul Smith’s story? I wonder if Proctor and Gamble sponsored the book (did the author receive money from them to write the book)? Stories are a perfect match for my business. I'm in network marketing so all I get paid for is by telling stories of my customers and business partners. After listening to this book I found out there's two kinds of story tellers in the world: those who tell stories and those who get paid for telling stories! What made the experience of listening to Lead with a Story the most enjoyable? The book follows its own advice. It engages the reader with stories and gives steps on using the stories for business. Although the title indicates it's also about crafting your own stories, there wasn't much emphasis on that. It's a good listen, you can see the value of storytelling... how it can motivate people to actions. This book was excellent. There were several insightful stories that I plan to use personally. I am sure this book will change how I begin my presentations and meetings. Great ideas and very practical application. The book has great ideas about achieving accomplishment with the help of telling stories. Easy to read and get inspiration. After listening to this book I want to immediately implement everything I learned. The author does a great job to simplify the topic, which often seems overwhelming, yet remains underrated in my opinion. Very good production.